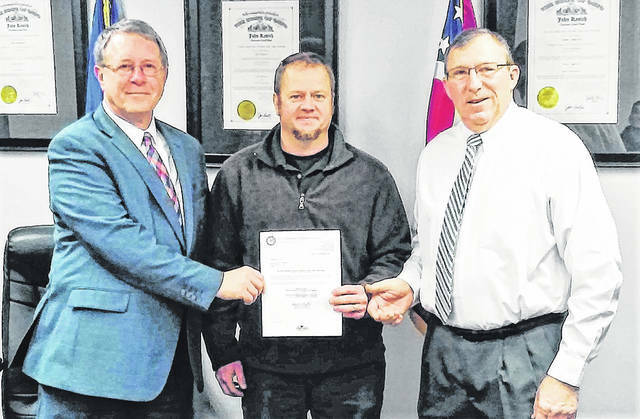 Nate Jester, district manager of the Division of Forestry for Pike State Forest, presented the Highland County commissioners with a check for more than $2,700 at their Wednesday morning meeting. The proceeds came from timber sales in the Healthy Timber Management Program at the state forest. Shown, from left, are Commissioner Gary Abernathy, Nate Jester and Commissioner Terry Britton. The president of the board of commissioners, Jeff Duncan, was absent due to being on a brief vacation. 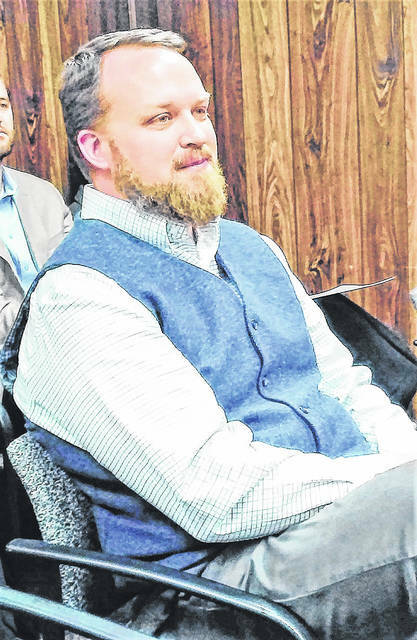 Highland County Health Commissioner Jared Warner warned of an uptick in both influenza and hepatitis-A cases during Wednesday’s commissioners meeting. He advised all residents to protect themselves by getting a flu shot, noting that it would take a few weeks for full immunization to take effect. Health officials in Ohio are now on record as having declared the state has widespread outbreaks of influenza, and Highland County Health Commissioner Jared Warner told county commissioners during their Wednesday meeting the area was solidly entrenched in the flu season. He advised that everyone get immunized against the potentially deadly illness, with the CDC recommending immunizations for everyone 6 months of age and older. Hepatitis A is on the rise as well in both Highland County and throughout southwest Ohio, Warner said, adding that locally there are now 20 confirmed cases of hepatitis A, but none are in “sensitive occupations” such as food service, health care and day care. Highland County Auditor Bill Fawley told commissioners that sales tax receipts for the first month of 2019 were better than at this time last year. Figures provided by the auditor’s office showed that January 2019 sales tax revenues exceeded last January’s amount by more than $28,000, continuing an upward trend that began in November. Another positive financial report was given by Commissioner Gary Abernathy, who said that on Wednesday the loan for construction of the Highland County Justice Center would be paid off roughly one year early. “We had an opportunity to get that debt off of the county books,” Commissioner Terry Britton said, commending a member of First State Bank, who was in attendance with other members of Leadership Highland County, for their continuing partnership on county projects. Nate Jester, district manager of the division of forestry for the Pike State Forest, continued the positive economic news by presenting commissioners with a check for $2,744.60 from the Healthy Timber Management Program. He told commissioners that when timber is sold on a competitive basis to the highest bidder, 65 percent of the net revenue is returned to the county, township and school district where that timber sale occurred. Pike State Forest occupies a small portion of eastern Highland County near Fort Hill State Memorial. Another valuable commodity provided by the sun is electricity, and Britton acknowledged receipt of a copy of the formal application filed Friday in Columbus by Hecate Energy Highland LLC. The application before the Ohio Power Siting Board was a certificate of environmental compatibility and public need for a solar powered electric generating facility. Abernathy said that a public hearing was scheduled for Feb. 19 at Bright Local Elementary School for public input regarding the Willowbrook Solar Construction Project. “A lot of neighboring landowners have questions since some of this seems to be happening quickly,” he said. As previously reported in The Times-Gazette, two separate photovoltaic power generating facilities have been proposed for construction in the Mowrystown area. Britton said that the Willowbrook project would cover roughly 1,200 acres with space-age solar panels, and the Hecate facility would occupy about 3,500 acres. He described getting state approval on the construction projects as being a lengthy process, with the Ohio Power Siting Board sorting through environmental impact statements, and seeking input from both the general public and landowners that would be affected. In other matters, commissioners approved a trio of resolutions dealing with line-item budget transfers. Two contracts were approved, one of which appointed Kelly Gorry as legal counsel for Highland County for matters pending before the Ohio Board of Tax Appeals. Qualified applicants are being sought for an appointment to the Highland County Law Library following the resignation of Gary Lewis from the board of directors. A physical law library is required by state law to be maintained at the county courthouse, Abernathy said, with the board of directors meeting four times annually to oversee its operation and maintenance. There will be no commissioners meeting on Monday, Jan. 21 in observance of Martin Luther King Jr. Day. The commissioners will reconvene their next bi-weekly meeting Wednesday, Jan. 23 at 9 a.m.